Elsie was featured in the D.W. Griffith film "The Great Love" (1918) which starred Lillian Gish and was shot entirely on location in London. Elsie's scene was a cameo with Lady Diana Manners, set in an idyllic garden pavilion. There were several celebrity "walk-ons" in this now lost motion picture including nobilities and royalty - Baroness Rothschild, Lady Paget, Violet Keppel (Great Grand-Daughter of Sir Allan Napier MacNab. ), the Princess of Monaco, even the Dowager Queen Alexandra! The Griffith Project at the Pordonone Silent Film Festival may have more information. 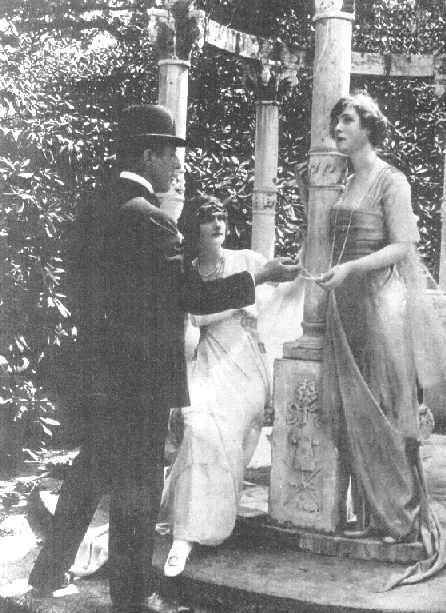 Elsie seated with Lady Diana Manners being directed by DW Griffith. Elsie's costume by Lucile. She made another film just after the first world war. Comradeship a 67 minute, black & white, silent picture made in 1919. This film, the first film production by theatre producer Sir Oswald Stoll, directed by Maurice Elvey, tells the story of two friends and their varying fortunes during WWI. Elsie plays Betty Mortimore and Gerald Ames, Guy Newall, and Peggy Carlisle starred alongside her. The film was very popular in its day. The National Film and Television Archive (British Film Institute) has a copy in its collection. I'm told that it is a nicely made film, for its time. There is a news reel recording a 'Gaiety Girls Tea Party' that Elsie attended in London on 24th June 1946. A preview of this can be downloaded, free of charge, from the British Pathe web site. This news reel is just 57 seconds long but does show Elsie quite clearly. I would like to feature the film on this site but to do so would cost £587 per year! So I'm afraid you will have to go to the British Pathe site and search for it. Many thanks to Patrick O'Connor for letting me know about this.